Looking for incredible Skin Care solutions? RainShadow Labs Will Help You "C"! RainShadow Labs has developed a premium base of Vitamin C formulas including a potent Vitamin C Serum. These formulas are designed for all skin types and will provide the most advanced protection from environmental aging. We have sourced the best highest quality raw materials and have combined them into a lush and effective line of Vitamin C formulas. The cutting edge of skin care research shows that aging skin is the result of more than just years on the calendar. Exposure to environmental elements like sunlight, smoke, and air pollution causes photoaging in skin. Not only does this lead to the formation of lines, wrinkles, and pigmentation - it may also lead to more serious skin conditions, including skin cancer. A comprehensive Vitamin C program can help prevent photo aging and the onset of more serious skin conditions. Topical vitamin C, including Vitamin C Serum, has now been shown to provide up to eight times the skin’s natural protection from UV damage. Sunscreens are also an important part of the prevention process, although they cannot do it alone. Vitamin C protects your skin from the sun in ways that sunscreens can’t. When used together, Vitamin C and sunscreens provide almost complete photo-protection; preventing photo aging and the appearance of fine lines and wrinkles, all the while promoting vibrant skin health. 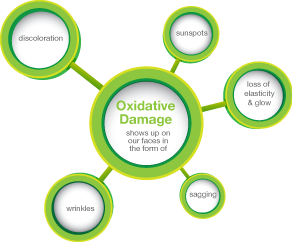 Oxidative damage shows up on our faces in the form of sunspots, discoloration, wrinkles, sagging, and loss of elasticity and glow. Vitamin C prevents oxidative damage by neutralizing oxygen-free radicals before they can attack the body. Some Vitamin C is available to the body by oral ingestion, but many individuals do not achieve even the minimum daily requirement through diet or supplements. Furthermore, Vitamin C cannot be stored in the body, and so must be reintroduced into the body AND skin on a daily basis. With this in mind, Private Label Manufacturer RainShadow Labs and their team of scientists and formulators have refined ways to stabilize and deliver additional amounts of key Vitamin C into the skin. Continued research has demonstrated that properly formulated vitamin C combinations work synergistically to provide enhanced benefit. 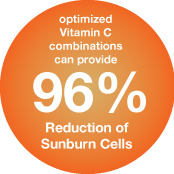 Recent studies show that topical application of optimized Vitamin C combinations can provide up to eight-fold antioxidant protection, ninety-six percent reduction of sunburn cells, and prevent the formation of free radicals in UV irradiated skin (sun exposed skin). The RainShadow Labs vitamin C formulations are superior to most of the C products on the market due to our use of a uniquely stabilized vitamin C called Stay C 50. Stay C 50 is water-soluble and is in a salt form. It is easily bio-converted to Vitamin C by skin enzymes. 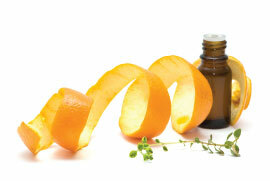 Ascorbyl-palmitate is the more commonly used form of vitamin C in skin care formulations today. It is more stable, meaning that it will not yellow the product base as quickly. The reason that RainShadow Labs does not use ascorbyl-palmitate is that it is not as easily converted to Vitamin C in the skin. It remains in the ester form for a longer period of time. This is not optimal, as we want the skin to bio-convert the provitamin form and take up the C right away! What good will a vitamin C concentrate do for your complexion and skin cells if it cannot actually penetrate into the skin? So what we are saying here is that the more commonly used ascorbyl palmitate is more stable but less bioavailable to the skin. RainShadow Labs uses Stay C 50 at concentrations that may turn the base a light cream color over time. That is because the Vitamin C is active. The main reason the palmitate version was created was to avoid the yellowing in formulation but really had nothing to do with the skin efficacy. We are only interested in efficacy, and if we have to watch a product turn a light yellow in order to have the best skin care available, well, so be it!! Vitamin-C is necessary for the production of collagen, the major structural protein of the skin and although visible differences will not be seen for approximately two months, you may notice a visible difference in skin texture, color and tone in as early as a few days. RainShadow Labs Topical Vitamin-C products, including our Vitamin C Serum will start to be absorbed by the skin almost immediately. Because these Vitamin-C products were developed as a preventative treatment with the goal of protecting the skin from further environmental damage, the skin will benefit the moment the Vitamin-C is applied. 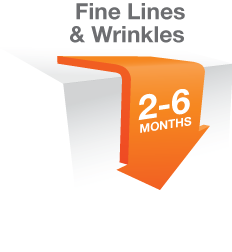 The appearance of fine lines and wrinkles will become less noticeable within two to six months. Individual results will vary, depending upon the condition of the skin at the time of initial use. Most individuals find the ideal time to apply Vitamin-C is in the morning, because during the day you are more susceptible to sun exposure and L-ascorbic acid provides photo protection from UVA/UVB radiation. You can also safely use it at night, as it stays in the skin for up to 72 hours, and cannot be washed off. Using the RainShadow Labs Vitamin C products once a day should be perfect for optimal results. Do not let the slight sting upon application scare you. The high acid levels are necessary in order for the Vitamin C to be absorbed. Other products with AHA’s can still very safely be used alongside of our Vitamin C formulations, and will actually be greatly enhanced by the addition of these products. Samples are available per your request. The question now remains…. To C or not to C?! We are in service to you!! !